UPDATE: February 28, 2017. Cayla has created a wristband honoring the memory of her teacher, mentor and friend, Ron Alexander. You can show your support with a $10 contribution to the Candler Field Museum Youth Aviation Program. Details here. The idea of being a pilot did not seem possible for a young woman with no connection to aviation. Cayla McLeod’s interest in aviation grew with her as she got older. Throughout her younger years, she had an interest in aviation. No one in her family flies, which makes her story intriguing. During her sophomore year of high school, a coworker of her father’s knew of Young Eagles rides taking place. Cayla took her first small airplane ride at the Young Eagles rally at PeachState Aerodrome in Williamson, Georgia. 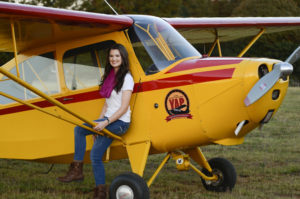 After enjoying her first ride in a small airplane she unexpectedly came across a rapidly growing youth aviation program. Shortly after learning more about this group, Cayla became a member. The Candler Field Museum Youth Aviation Program, founded by Ron Alexander, gives one free hour of flight time for every ten hours of work restoring vintage aircraft. Cayla started her flight training when she had 300 “shop hours” in the book. This allowed her 30 free hours of flight time. All of us remember the day we set off on our first solo. I soloed three years ago in a Piper Cub. I asked Cayla about her first solo –were you afraid, nervous, excited, etc.? Her comment was “I wasn’t excited or nervous, but I was confident. I acted like Ron was in the back seat and I just pretended it was a normal flight.” I laugh at this because looking back, I did the same thing on my solo. I also asked Cayla if she had any interesting flying stories she was willing to tell and her comment was “During one of my first lessons in our youth program’s Aeronca Champ, Mr. Ron and I experienced a series of three engine failures! I remember Ron gracefully taking the controls.” Further Cayla explains the sense of calmness and decisiveness Ron showed and how it had wore off on her during her training and that particular moment. Those of us who are adherents of antique and classic airplanes know that sometime in the future it is more than likely we will end up working on our airplane. We all tend to do it on necessity, but on occasion we do it to learn more about the airplane we are flying. This is convenient when a mechanical problem develops in flight. Cayla is very aware of this and finds herself working toward her A&P license. Now with over 200 hours towards the license. 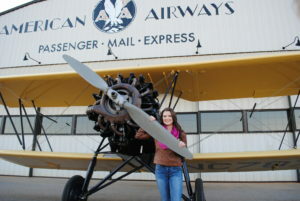 Cayla is involved with the helping of the promoting their youth aviation program, museum, and in helping with DC-3 rides. What about advice to other young adults who want to get involved in aviation? Cayla says “Getting involved with aviation has been the best decision I’ve ever made. The people in this field are the best people you will meet, careers in aviation are in more demand than ever, and most importantly you will never have to work a day in your life! You will not regret joining our aviation family!” Further Cayla discussed that she thinks EAA and VAA should help start up and sponsor more youth aviation programs like the one she’s in. She also says EAA traveling to high schools to talk about aviation would have a good impact with more youth getting involved with aviation. There you have Cayla McLeod’s story. 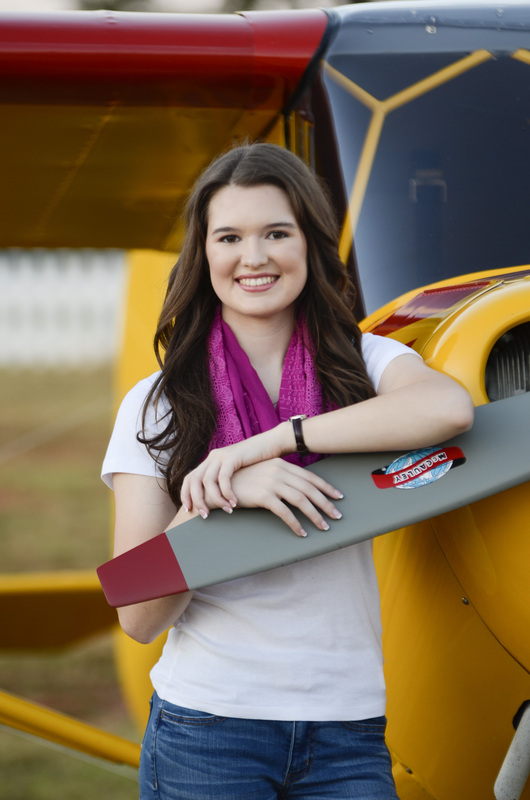 Cayla is 17 years old, the holder of a Student Pilot certificate and a Senior at East Coweta High School in Sharpsburg, Georgia. She is based at the PeachState Airport (GA2) in Williamson, GA. Her long term career goal is to become a commercial airline pilot. Cayla had a great mentor in Ron Alexander for her early start to her aviation journey. There is no doubt in me that she will do great things for young aviators and the aviation community. She is a living example of the enthusiasm Ron put forth in bringing up the new generation of aviators. 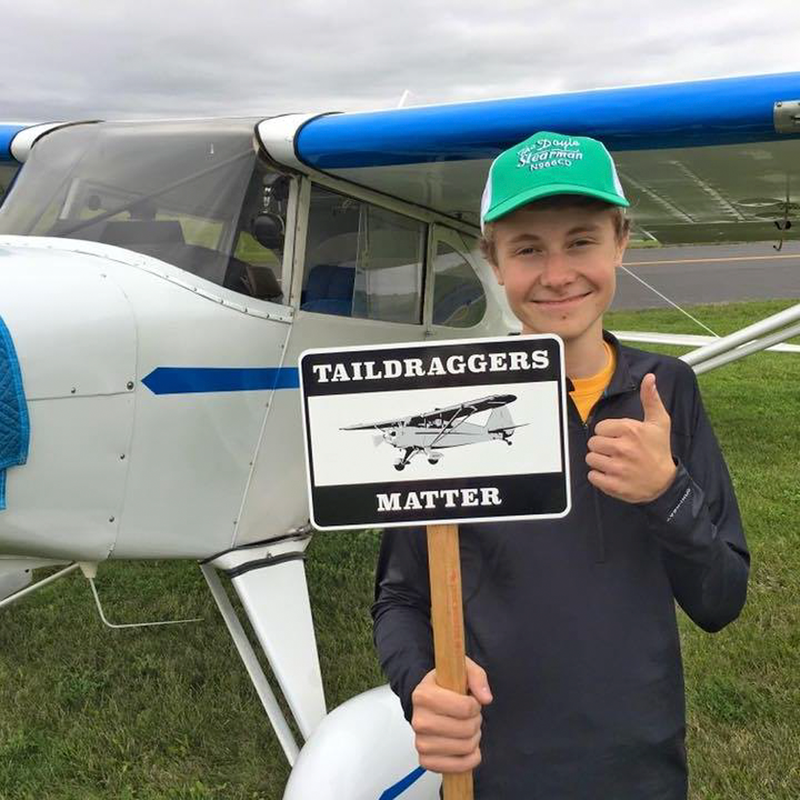 My name is Luke Lachendro, I am 19 years old, a private pilot, active Vintage Volunteer, and currently attending the University of Wisconsin-Fond du Lac working towards a degree in business. With this degree, I hope to do well as a contractor so that I can provide the experience of flight for the younger generation at little or no cost. I live on a private strip 45 minutes south of Oshkosh. I have been fortunate enough to grow up with an airplane in the back yard throughout my life. After the devastating loss of Ron, I got to thinking that Ron wouldn’t want this series to fade away without him. Ron and I had similar ideas when it came to possibilities on how to get more young people involved with aviation. A large portion of Ron’s legacy lives on through the kids’ lives he touched through his Youth Aviation Program at PeachState Aerodrome. After interviewing Cayla for this article, if I didn’t know any better I would have thought I was talking to Ron. If you know of a teen or young adult involved with vintage aircraft, I would be glad share their story. You can contact me here.